DURBAN, South Africa, June 5, 2014 (ENS) – A global strategy to prevent extinction and promote recovery of sawfishes, devastated worldwide by overfishing and habitat loss, was introduced today by the Shark Specialist Group of the International Union for Conservation of Nature, IUCN. Sawfishes – warm water, shark-like rays characterized by long, toothed snouts, or rostra – are the largest of the rays, reaching over seven meters in length. Once found in the coastal waters and rivers of more than 90 tropical and subtropical countries, all five species are today classified as Endangered or Critically Endangered on the IUCN Red List. The strategy is being launched at the Sharks International conference in Durban and coincides with announcements that two West Africa countries – Guinea and Guinea Bissau – are proposing the listing of sawfishes under the Convention on Migratory Species in November, an action that could boost protections. “The sawfishes, revered for millennia by coastal cultures around the world, now face greater extinction risk than any other family of marine fish,” said strategy co-author, Dr. Nick Dulvy, who serves as IUCN SSG Co-Chair and Canada Research Chair at Simon Fraser University in British Columbia. “With this comprehensive strategy, we aim to reignite sawfish reverence and spark conservation action in time to bring these iconic species back from the brink,” said Dulvy. Mortality from targeted and incidental fishing is the main threat to sawfish. Their rostra, which they use to detect and wound prey, are easily entangled in many types of fishing gear, particularly trawls and gillnets. The destruction of key habitats, such as mangroves, also poses a threat to sawfish survival. “Although these species are perilously close to extinction in many regions, there are some fairly simple ways to help populations recover. For example, we know that sawfish can actually survive capture quite well if handled properly, and hence, basic education of commercial, subsistence, and recreational fishers is central to our conservation strategy,” said Dr. Colin Simpfendorfer, IUCN SSG Co-Chair, Professor of Environmental Science at James Cook University in Queensland. Dr. Simpfendorfer led the development of the U.S. recovery plan that has improved the status of smalltooth sawfish in Florida. To complement an existing ban on commercial international sawfish trade, the new strategy calls for national and regional actions to prohibit intentional killing of sawfish, minimize mortality of accidental catches, protect sawfish habitats, and ensure effective enforcement of such safeguards. The document also sets forth actions associated with effective communications, capacity building, strategic research, and responsible husbandry, as well as fundraising to ensure implementation. “Over the last decade, sawfish conservation policies have greatly improved in several countries and globally, but much more action is urgently needed to safeguard these magnificent animals,” said Sonja Fordham, IUCN SSG Deputy Chair and president of the Washington, DC-based Shark Advocates International, a project of The Ocean Foundation. “We are extremely pleased that Guinea Bissau and Guinea will propose sawfish for listing under the Convention on Migratory Species, as this treaty offers an excellent framework for prompting national protection in many priority sawfish range states and for implementing our global strategy on a regional basis,” she said. The strategy is the result of a 2012 Shark Specialist Group workshop where the world’s sawfish experts developed a global sawfish conservation vision, goals, and prioritized actions. The document also includes information on sawfish biology, distribution, cultural value, history of exploitation, current threats, regional status accounts, and conservation policies compiled by leading authorities. The Sharks International Conference is being hosted by Kwa-Zulu Natal Sharks Board and will feature multiple presentations on sawfish biology and conservation by experts from around the world. Sawfish feature prominently in folklore from places such as Panama, Papua New Guinea, and Borneo. They have been particularly important to West African cultures, where they symbolize justice and appear on regional currency. Sawfish rostra are universally valued as curios and have been used in traditional medicine in many countries including Mexico, Brazil, Kenya, Iran, India, and China. The rostral teeth are prized as cockfighting spurs in Latin America and the Caribbean. 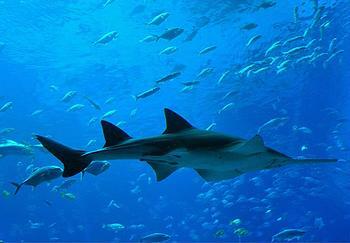 Sawfish meat is consumed in some places; sawfish fins are exceptionally valuable for shark fin soup in Asia. The species also serve as popular aquarium attractions.